1. Make yourself easy to find: Imagine someone is searching for a product or service that you sell, but for some reason, they don’t reach you. It could be because your business doesn’t show up on the first page of the search engine; perhaps your website doesn’t work on the browser they are using, or it’s not mobile-optimized. Whatever the reason may be, it’s that easy to lose a potential customer. All it takes is a few small steps to make sure the right audience can discover you: have a strong SEO strategy in place, test how well your website works on popular browsers, and ensure that the site is mobile-friendly. 2. Be accessible: Using key communication channels, such as customer support email or contact forms, and increasing your company’s presence on social media will all make your business more accessible to potential customers. 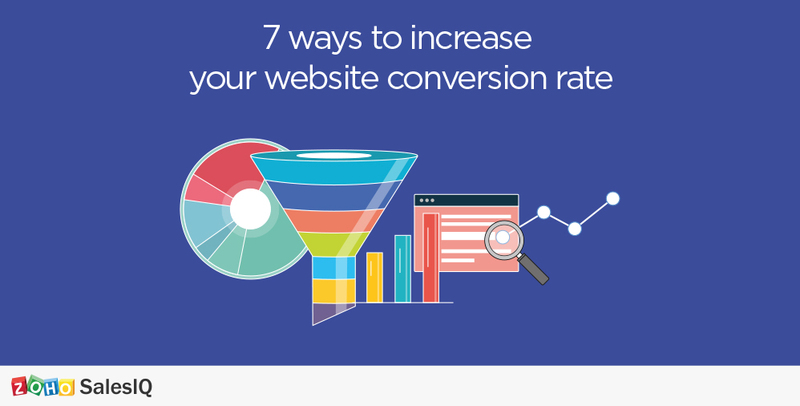 However, if you really want to ramp up those conversion numbers, consider adding a live chat feature to your webpage. Consumers prefer live chat for customer support, and the major reason for that is they receive immediate answers to their questions. In fact, not only can adding live chat to your website increase your conversions by up to 30%, it can also help you land huge deals with prominent clients: John Hood, who runs an audio/video company called The Farm AV, closed a $500k+ deal thanks to the live chat feature he added to his website. Maybe your visitor is hesitant to buy because they have a simple question about a product, or there may be some technical error on the site preventing them from buying. Live chat lets you engage with your visitors in real time, so you can immediately take care of these issues for them and make more sales. 3. Build trust and relationship: It’s important that you give visitors to your website plenty of reasons to trust in your business and the services you provide. Display reviews and testimonials on your site so new visitors can see what your customers love about your product and why they value your business. Engage with your customers (and potential ones) on social media to show you’re listening to them and their feedback is valued. When they are happy with your service, they’ll spread the word, resulting in more customers. 4. Know your visitors: We have spoken earlier about the importance of knowing your website visitors. Having a website visitors insights tool, like Zoho SalesIQ, can help you see which visitors are recurring and which are new so you can connect with them better. It would help you not only understand and address their concerns, but also position and market your products better. 5. A/B test your website elements: A/B testing is basically showing two versions of a web page to different sets of audience and using the one which has the best conversion rate. There are many elements on your web page that you can test, such as CTA buttons (their color, placement and text), page layout and design, headlines and messaging, and new media elements (picture size, videos, etc). All of these small changes can make a huge difference. For example, a European e-commerce firm that sells hand-painted porcelain increased their conversion rate by 35.8% by just changing the color of their CTA button, and removing promo-code boxes from checkout page helped Bionic Gloves increase their total revenue by 24.7%. It’s important to remember that A/B testing should not be a one-time event: continually update your website and experiment to optimize your conversion rate. 6. Segment your visitors: Some people visit your website because they need to buy something, some might be casually browsing, and then there are some who have opened your website on a browser tab and forgotten about it. Segmenting your visitors as hot, warm, and cold leads can help you target the right audience in the right way. Each of these leads requires a different level of energy and resources from your sales team. The first category requires immediate attention (live chat is a good way to do this); the second one needs a discount offer on products they are browsing; and the third category needs to be shown your bestsellers when they return. 7. Have an engaging website: A clutter-free interface with compelling content that clearly states your USP will immediately connect you with your website visitors. Encourage your visitors to stay and browse by offering details about your products and having a section of relevant blogs or articles around them. Your visitors will see more value in your business if you can offer them more than just a product catalogue, making them more likely to buy from you than your competitors. Do you have more tips? Share them in the comments section below.